A handful of our top houses received what they deserved, and that is, a new gold-ribbon Preferred Partner badge for the highest levels of ethics and service. Several Proxiblog houses have received the gold-ribbon badge, including Jewelry Exchange, Midwest Coins, Weaver’s Signature Coin and Currency Auction, Meares Auction Group, and K&K Auction (Krause), among others. We believe the badge system is important to frictionless bidding on the portal. We especially like this new badge because it highlights service and ethics, two key components in our own rankings. The strategic partnership means that the auction company has signed an exclusive contract with Proxibid. This strategic partnership provides the auction company with perks others don’t receive such as access to a Client Services Manager, more auction management tools and special discounts. 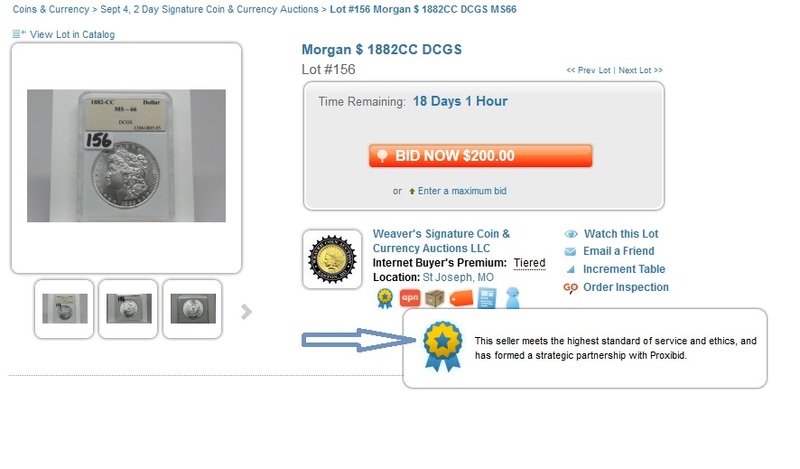 The only badge left now is one for photography, the most important component for successful online bidding. This entry was posted in Best Practices, Featured Updates and tagged Jewelry Exchange, Krause Auctioneering, Meares Auction Group, Midwest Coins, Preferred Partnership, Weaver Signature Coin Auction. Bookmark the permalink.